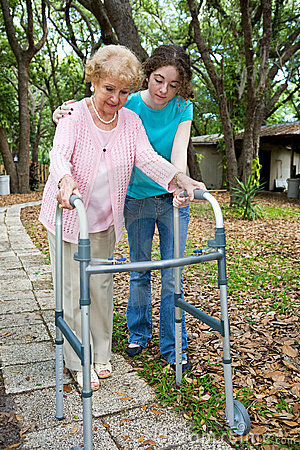 If your loved one is feeling weak and unsteady, it may be time to consider a walking aid. My mother became quite weak and unbalanced as a result of extended periods of being bedridden and muscle wasting. She first began to use a walker when it was provided in the hospital for her to use to get to the bathroom and to walk in the hallway if she was able. It can be difficult to see someone you knew as able bodied suddenly using (and needing) a walking aid because it is a stark reminder of their illness and disability. This was early enough in the disease that Mom was having some periods of stability; so when she was discharged from the hospital, it was necessary to look into purchasing her own walker. My parents purchased a terrific walker with a basket and a seat, and Mom found it very useful for when she was able to go out for short walks and visits, and for attending medical appointments. Her walker was a “rollator” type, meaning it had wheels on it. Hers was a four-wheel walker which allowed her to place weight on the walker as she moved. Later on, when Mom was back in the hospital, she brought her own walker with her, and was glad to have it with her, as it was the proper size and she was used to it. Good Example: The Drive Medical Adjustable Height Rollator with 6″ Wheels includes an adjustable seat and handlebar height and offers great comfort and support. The rollator frame’s height can be adjusted from 18in. to 22in. in 1in. increments and the height of handles adjusts from 29.5in. to 38in. 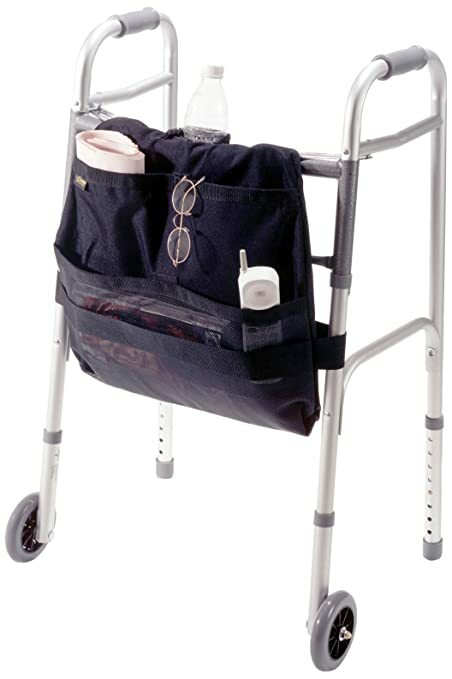 This aluminum frame rollator comes with deluxe loop brakes for added security and features removable, padded backrest and padded seat with zippered pouch. It requires only simple, tool-free assembly. You can see more details on the Drive Rollator here. Will you be using it outdoors as well as indoors? If using it outdoors you should consider looking at a rollator with larger wheels on it as they will be more stable outside. Wider wheels also track better over rougher surfaces. Will you be lifting onto a bus, up stairs, or into a vehicle? Lighter weight walkers are better if you are lifting the walker. You also want to look at whether you have to remove the basket before it can be folded and if so how easy is it to remove. Do you have limited space for storing it? If you have a small home you should look at walkers that fold up smaller and can stand on their own when folded so they can easily be stored in a closet or hallway. Note that basic walkers (without wheels) are also an option. They are called “standard walkers,” and are designed for people for whom stability is a significant concern. Recommended Basic Walker – The Invacare I-Class Dual-Release Lightweight Folding Walker comes with a deep, wide frame with a large number of height adjustments. The walker features a lower side brace for added stability and is easy to lift and maneuver. It has anti-rattle silencers that provide quieter operation and PVC handgrips for comfort and long-lasting wear. The drawback with standard walkers is that you must pick up and move it as you walk. Most people end up choosing between two-wheel and four-wheel walkers. Check your elbow bend. Keeping your shoulders relaxed, place your hands on the grips. Your elbows should bend at a comfortable angle of about 15 degrees. Check your wrist height. Stand inside the walker and relax your arms at your sides. The top of your walker should line up with the crease on the inside of your wrist. The height of the seat will vary from person to person and depend on leg strength; tall people with good leg strength sometimes prefer a lower seat, even though they might be measured for a higher one. Shorter individuals might be measured for a low seat, but prefer a taller one because they have bad knees or poor leg strength. For them, the less they have to bend, the better. Generally, however, when sitting on the seat, your feet should be flat on the floor. Walkers have adjustable arms that allow you to raise or lower the push handles. A good rule of thumb for knowing if your walker fits you is to stand in front of your it in a relaxed but upright position. You don’t want to strain to point that you are creating discomfort while standing, but you do want to get better at remaining aware of your posture and striving to improve it. Standing straight, allow your arms to fall loosely at your sides. The top of the push handle should meet at the approximate location of your wrist. If the push handle is closer to your fingertips, the walker is too short and needs to be adjusted. If the push handles are closer to your elbow, the walker is too high. In both cases, you will need to adjust your walker so that it fits your properly (If you have already adjusted it and there is no adjustability left, you might need a new walker). Keep in mind that walkers are not meant to be pushed in front of you like a shopping cart. Otherwise if you stumble the walker can push forward and you could fall. When you walk with your walker you should be standing in next to the seat. Often people feel like the handles on their walker are too low but when you stand properly next to it you’ll find those handles are higher than you thought. Try standing next to the walker with arms at your side and to look for the handles to be at wrist-watch height. If they line up with your watch you should be good to go! Accessories can make it easier to use your walker. Trays can help you carry food, drinks and other items to a table. A pouch attached to the side can carry books or magazines. Some walkers can also be fitted with seats or baskets. The Nova Ortho-Med Tray is a convenient way to transport food and other personal items. The tray features a cup holder that prevents drinks from spilling. This is easy to installs with 4 attachable clamps. This tray can fit to 4080 and 4090 series folding walkers. EZ Access Walker Carry-On – Durable, lightweight, water-resistant nylon design and three deep pockets make this front mounted bag a necessity for every walker! Allows hands-free transportation of personal items. Custom designed detachable beverage holder. 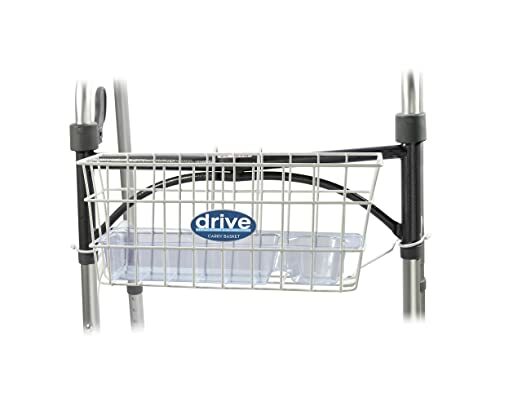 The Drive Medical Walker Basket features a cup holder and a plastic tray. This basket can complement any 1″ folding walkers to make transporting personal goods easy. Be sure not to overload your walker. Remember that whichever walker you choose, make sure you maintain it. Worn-out or loose rubber caps or grips and loose or excessively tight brakes may increase your risk of falling while using a walker. If you think it might be time for a walker, take some time to think about your physical needs, and how and where you will be using it. Walkers come in a variety of configurations these days, most fold for storage and transporting and all help keep people who are unsteady on their feet stay safe while walking and standing by providing a stable device to put their weight on. Where they will differ is in their design. View medical walkers on Amazon. This was very informational and is definitely something someone could use as they get older. I never knew so much went into fitting a walker to someone but it does make sense! Are there a lot of places to find them or what is the top place you recommend? Also how adjustable are they? Thank you for your comment. Medical mobility products are widely available, both at medical supply stores and online. If you click on my sample photos, you will find walkers for sale at Amazon. This is a good way to see a huge variety of units and compare features and prices. As for adjustments, you can adjust the arms of the walkers, as well asthe seat, if there is one. I have a sick parent and we are considering if they need a walker and what type exactly. Your post was thorough in explaining what we should consider and look for when choosing a walker. It was very helpful for me. Can you recommend any particular make or model of walkers? I liked the walkers accessories you showed. l’ve never seen them before or knew something like that existed. It comes with the seat and basket, is reasonably priced, and has many excellent reviews. Please drop by again and let me know what you kind you chose and how it’s working out. My father-in-law had a walker that he used. I wish we had know of your tips on the different types of walkers and how to fit them at that time. At first he had what you call the standard walker without wheels. The issue he had with it was that he would tired of picking it up and moving it after a short time. So, he didn’t want t use it. He then graduated to one with wheels but the issue with that one is if he started to lose his balance the walker would more away from him and he could fall. He liked this much better except for that part. I could very well be in the market soon for one of my relatives. They live in an area with rough sidewalks and curbs. Their balance is still okay, they just need something to lean on and rest. I think one with 4 wheels? What brand do you recommend? Thanks for your comment, Xin. I think that in your father-in-law’s case, a walker with two wheels would have been a happy medium; the two legs without wheels means the user won’t lose control, and the two wheels means lifting the entire walker isn’t needed to get moving. As far as purchasing one, it’s always best to go into a localmedical supply store so the various units can be tested out. Alternatively, walkers of all types can be purchased online. If you click on my example pictures, you can see a huge variety of walkers and compare the features and prices. This is a good information for those looking for a suitable walker for loved ones who are recovering from illness or are in need of physical mobility. Thank you for the reminder of the need to maintain the walker. I do agree with your thoughtful note on checking the brakes! When it gets too technical to maintain, it is certainly good to ensure the manufacturer has a recommended after sales service centre around. Thank you for sharing! Thanks for your comment, Fred. Yes, regular maintenance is important. You can have maintenance done at your local medical supply store. They are quitesimple to maintain. Really great recommendations on whether or not somebody should use a walker. I know that sometimes people might not want to use one because of the thought that it goes with, becoming disables or whatever, but when it’s necessary it really is necessary. Keep up the good work! Looking forward to some more posts. Thank you for your comment JP. Yes, there’s definitely a mental hurdle to get over considering a mobility aid. Thank You as I research the Walker with wheels I didn’t understand how the hand break worked and if they would fall if it slipped from under them. The piece you wrote was very informative and the graphics were nice to. I knew exactly what I was looking at. Again Thank You very much. Thank you for your comment, Mike. I’m glad this information was useful for you. I think a walking aid is a fabulous thing, it can become so easy to lose your identity and freedom if you are unable to get around. At least here you are able to keep a piece of who you are. One thing I noticed was the change in text colour in your post, i’m not sure if this was intentional? Hi Dawn – thank you for your constructive feedback. Yes, it’s so important to get over any feelings of embarrassment one may have about using a mobility aid because it’s so important to just keep moving as well as we can! The font color change was intentional to indicate personal advice, as opposed to strictly informational content. Since it doesn’t seem obvious, I will reassess it. i found your website article very intersting i will be definitely be taking into account everything you said in case my grandma needs one of these medical walkers. you provided some really good information, well done, i think many people will find this useful. Thank you for visiting, Matthew. I’m glad this post helped you. Please stop by again and let me know how your shopping for medical walkers went.